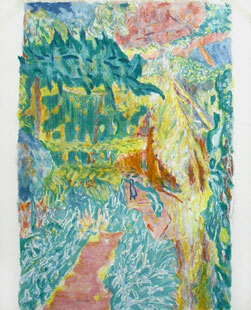 Here are the prints by Villon that are presently for sale. 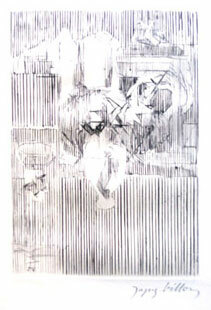 Click on the image to enlarge it. 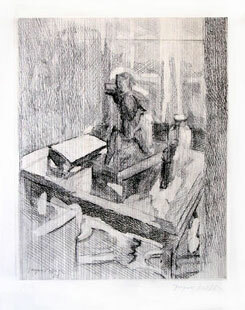 Jacques Villon was born Emile Méry Frédéric Gaston Duchamp (his real name), in 1875 in Damville (department of The Eure). 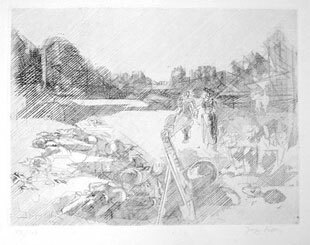 Aged 16, he made his first prints (engravings) in the studio of his grandfather, the Rouen painter and engraver Emile Nicolle. 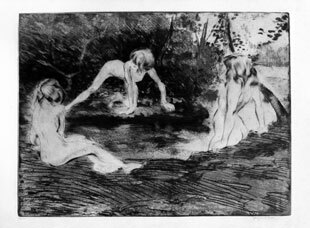 In 1894, Villon enrolled at the Rouen Beaux-Arts and his first drawings were published in the local art-review “Rouen Artiste”. 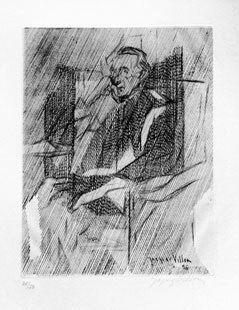 A year later, Jacques Villon moved to Paris and went to the Atelier Cormon, where memories of Gauguin, Van Gogh and Toulouse Lautrec were still fresh. At about this time, Villon had himself called Jack (later changed to Jacques) Villon (referring to the 15th century poet). In 1897, his drawings illustrated several satirical weeklies : “L’Assiette au Beurre”, “Le Rire”, “Le Chat Noir”, and above all “Le Courrier Français”. 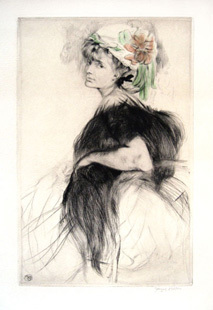 Villon met Renoir, Steinlen and Francis Jourdain, who taught him colour aquatint technique ; Edmond Sagot became his publisher. 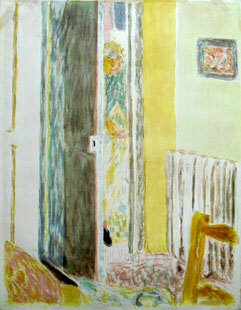 Between 1901 and 1905, his work was acknowledged by the artist milieu : in 1901, he showed two prints (etchings) at The Société des Beaux Arts ; in 1902, he entirely illustrated an issue of “L’Assiette au Beurre” ; in 1903, he showed 3 engravings at the Salon d’Automne. 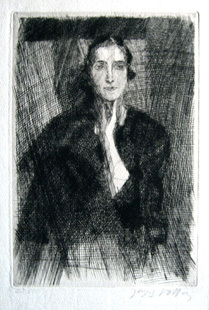 In 1904, Villon engraved Sagot’s visiting card and Delâtre’s greeting card ; in 1905, the Legrip Gallery in Rouen held his first one-man show. 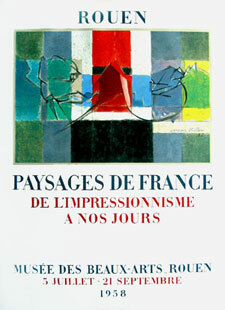 In 1910, Jules Roques, manager of the “Courrier Français” died and Jacques Villon stopped working for the press in order to concentrate on his painting and print. 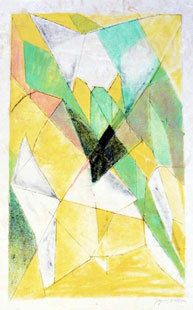 In the 1910s Villon was part of the Puteaux group, also called “Golden Mean” group, which included Gleizes, Marcel Duchamp (Jacques’brother), Metzinger, Picabia, Léger, La Fresnaye, Laurencin. 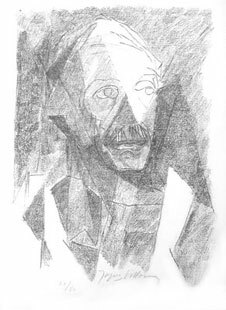 In 1912, Villon resigned from the committee of the Salon d’Automne to protest against the president’s disapproval of cubism. He showed in New-York in 1913 ; at the outbreak of the war he was called up, taking part in military operations. 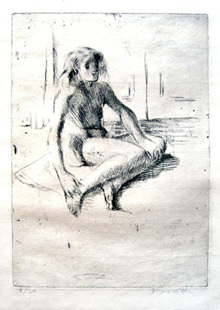 After the war, Villon resumed his print, almost engraving, maintaining a large output until 1922. 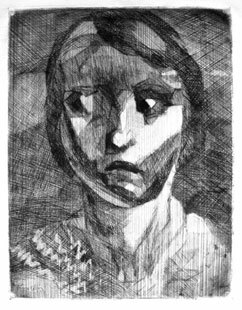 Amongst the most well-known are the 1919 “Renée de face” ; the 1920 etching “Baudelaire au socle” and “La table d’échecs” (The chess table) etc. 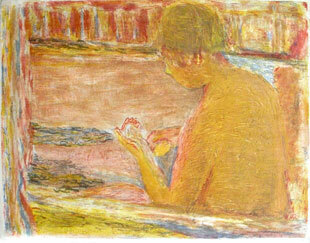 In the thirties, several exhibitions of his work were held in France and in the U.S. (where he was better known). 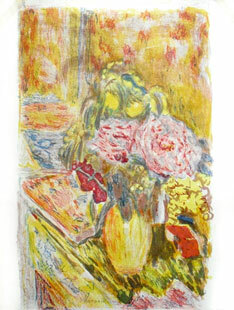 When the German invasion drew near, Villon moved to the Eure, and then to the Tarn, where he painted landscapes. In 1942, the Galerie de France showed his work, and he met Louis Carré who became his dealer and organized shows throughout the world. 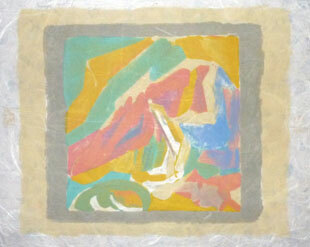 Villon’s first big show was held in 1944 at the Louis Carré gallery, comprising 39 paintings. Jacques Villon has at last attained true recognition, and he wittily remarked : “The difficult thing in painting is the first seventy years”. 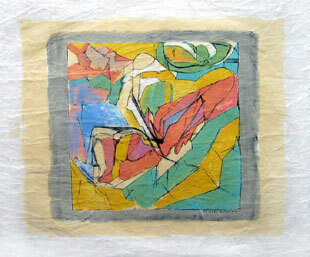 Villon was launched as an artist, as was confirmed by the numerous exhibitions and awards which followed until his death in 1963.